VATICAN CITY, NOV. 27, 2007 (www.Zenit.org).- The College of Cardinals is a representation of the Church's catholicity, Benedict XVI affirmed Monday, and the 70 countries represented by those wearing red hats is proof enough. With the new cardinals elevated in Saturday's consistory, the College of Cardinals has 201 members. Of those, 120 could vote in a conclave to elect a Pope. Eighty-one cardinals are over the age 80, and thus no longer eligible to vote. More than half of the cardinals are European: a total of 104, of whom 60 are possible electors. Latin America has 34 cardinals (21 electors), while 20 come from the United States or Canada (16 electors). From Africa come 18 cardinals (nine electors); from Asia, there are 21 (12 electors); and from Oceania, four (two electors). 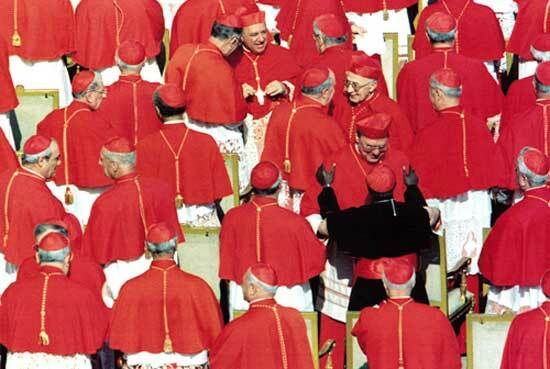 Italy is historically the country with the largest number of cardinals: Currently it has 42 (21 electors). It is followed by the United States, which has 17 (13 electors). Spain has 10 cardinals (six electors); France and Brazil both have nine (six and four electors, respectively). Continuing this list is Poland with eight cardinals (four electors) and Germany with seven (six electors). Mexico and India both have six cardinals (four and three electors, respectively). Argentina has four (two electors). Six countries have three cardinals each: Australia, Ireland and Switzerland (one elector each); Philippines (two electors); and Colombia and Canada (3 electors each). Great Britain, Portugal, Hungary, Ukraine, Austria, Czech Republic, Slovakia, Chile, Nigeria, Ghana, Vietnam and Korea have two cardinals each. There are 39 cardinals from religious congregations. Of the current cardinals, seven were elevated by Pope Paul VI, all of whom are now over the age of 80. Pope John Paul II elevated 156 of the current cardinals; 90 of them are still electors. And Benedict XVI has elevated 38 cardinals, 30 of whom are electors.